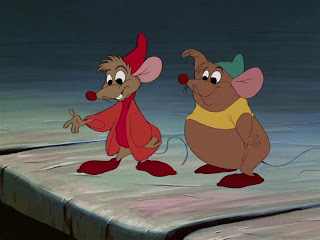 Disney has a way of creating the most lovable sidekicks imaginable, which made today's favorite another tough decision! I went back and forth, but finally I think I've decided - Jaq and Gus, Cinderella's mice friends, are at the top of my sidekick list. These little guys are incredible. They go through all sorts of trials for Cinderella - finding beads to accessorize the ball gown, hauling a key up a gazillion stairs to free her so that she can escape in time to try on the glass slipper - and let's not forget how they were magically transformed into horses and run themselves ragged trying to get poor Cinderella home after the ball by the stroke of midnight!